Redhill and Reigate Golf Club was established in the 1880s and was the second oldest golf club in the county. According to SurreyLive, the venue ‘has battled to stay afloat for almost two decades’. 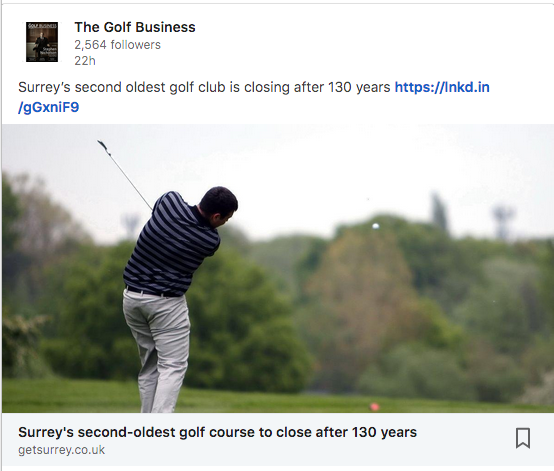 The club is set to close at the end of March – meaning at least three golf clubs, North Luffenham in the East Midlands, Maywood in Derbyshire and now Redhill and Reigate will all shut down just a few hours after the UK is set to leave the European Union. Redhill and Reigate’s clubhouse, which is privately owned and a separate entity, will however continue to operate as a venue, reports the website. Club chairman Tony Hallett said: “I and the trustees appreciate all the help and support the council has given over several years whilst we have kept the club open in adverse trading conditions. The council had been in discussions with other potential operators to run a ‘pay and play’ golf course as an interim solution, but efforts failed. The club had 660 members in the mid-1970s but that had plummeted below 300 by 2013. That year, the club, which had been owned by members since its inception in 1887, almost closed. It was saved by a sell-off and became proprietor-led for the first time. At the time, loans of £120,000 it had borrowed from members to stay afloat remained unpaid. A local golfer said: “Everybody is totally gutted. There’s no real reason for it; it’s senseless, but everyone understands the owner’s side – you can’t keep funding something forever with your own personal money. “The golf club has gone and the common will, I feel, be a worse place for it which for everybody else apart from golfers, is a real shame. A council spokesperson said the club was given a reduced rate when a 10-year-licence was granted in 2009, which was further cut in 2014 and in 2017. Cllr Alex Horwood, the council’s executive member for neighbourhood services, said: “Our intention is to keep the site as a golf course for community use in future and we’re investigating options and potential operators to allow this to happen, but this will take time. 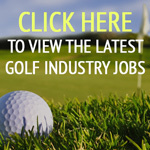 In January Brunston Castle Golf Club in Scotland announced it has closed down and at the end of last year at least six UK golf clubs closed down in the space of six weeks, including Potters Bar Golf Club in Hertfordshire, Carrick Knowe Golf Club in Edinburgh, Fishwick Hall Golf Club in Lancashire, Raglan Parc Golf Club in Wales, Canwick Park Golf Club in Lincolnshire and Southwood Golf Course in Farnborough. It Is a very hard period for the UK golf. Which are the reasons of All these crisis? Too many golf courses. Not enough golfers who want to be a member of a club. Very true have tried joining couple of local clubs that are”exclusive” don’t know why all I want is to be able to play golf but they are too stuck up!!! A pity. New generation weaned by computer age, not joiners like elders, want “quick-in/quick-out” efficient golf! 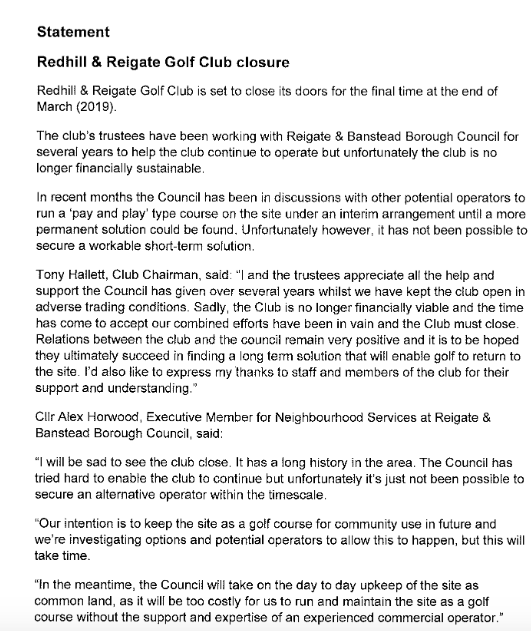 Sad times, I have heard rumours of 2 local golf course in Kent closing, this follows the recent closure of Broke Hill. So, what are you going to do, watch them all close? Times change! We had the same thing happen here with courses closing all over. With new culture, fewer golfers coming, we asked why? Game takes too long, costs to much and too frustrating! So we developed new Hybrid golf ball that solves these issues and makes golf enjoyable again. Now we have more golfers playing! What about the “pay & play” as a solution ? How does pay & play really change the game? It’s just the same uninspiring format in smaller segments. Got to make the modern golf game quick, affordable & enjoyable for the new generation, if you want to grow the game. Revitalise the old Clubs,instead of building new ones. We thought like that too, but felt shorted not being able to play the traditional round. So we started using the new generation Hybrid golf ball developed for “big course play” on shorter courses. Now we play a quick, affordable & less frustrating full 18-hole round in only 21/2 – 3 hours! Since the ball is proportionally distance-to-weight designed (meets golf standards), it give us the same format, in a compact modern time saving form. The ball actually improves the par, play & design of the course with little expense. Just adjust the tee placement and Hybrid par of each hole and it’s an easy conversion for a new course!